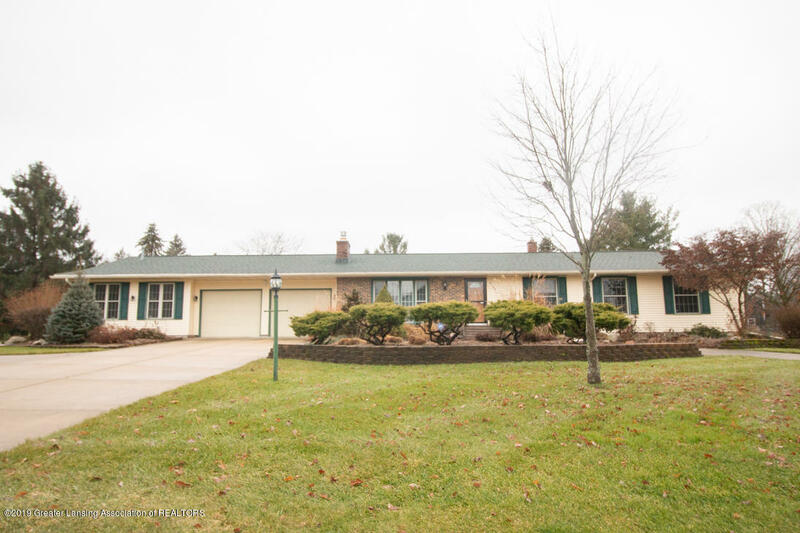 Beautiful Ranch home with many updates and extra's on a double lot with giant pole barn! Inside you will find a living room with stone fireplace and built in shelving, an updated kitchen complete with custom cabinets, quartz counter tops, stainless steel appliances, ample counter space and movable island. Located next to the kitchen, overlooking the back yard through 3 walls of windows is a beautiful room which could be used as a formal dining room or additional family room. The master suite boasts a large walk in closet, private bath complete with sitting room featuring cathedral ceilings, and amazing view, a soaking tub and tile shower. Two additional bedrooms complete the first floor. The lower level is finished with large rec room and office or craft room. Directions: Packard hwy/Lansing Rd West on Packard, north on Otto, East on Brookmead, corner of Candlewood and Winding Way.